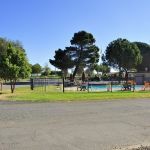 Ask fellow campers about "Banning Stagecoach KOA" and nearby attractions. Beautiful park. Our first KOA and it was lovely. Nice enclosed dog park, green lawns and beautiful view of mountains. We stayed in a long pull thru because we weren't unhitching our tow car. The host was friendly and helpful. Cable and wifi awesome. Easy in and out to I-10. 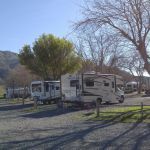 We camped at Banning Stagecoach KOA in a Motorhome. we paid for a pull through site and specifically said we had a 35' MH towing. The clerk acknowledged. The site was a most 38' long and was not very level. Needed blocks front to rear and side to side. This is the 2nd time I have had the same experience. That said, park is well maintained and attractive for a KOA I won't stay here again We camped at Banning Stagecoach KOA in a Motorhome. Typical KOA, long enough , level site so we didn't have to unhook the tow. Dog park was ok but we thought our smallest dog might be able to get under one gate. Everything worked. The trains were noisy but typical for RV parks next to train tracks or highways or between them. I would stay there again We camped at Banning Stagecoach KOA in a Motorhome. Stayed here 2 nights in March. Nice park , well kept , on the edge of town , but very convenient for food and shopping. Nice folks with a great staff. Excellent sites that will only get better as the shrubs mature between them. We will definitely stay here again ! 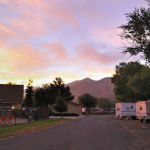 We camped at Banning Stagecoach KOA in a Travel Trailer. We've stayed here before. It is located adjacent to a high school, on Friday nights you may experience football games. But it was not objectionable. When I called for the reservation, I was given space 70. Upon arrival (after the office was closed) we were switched to site 73. Arrived at site 73 to find it previously assigned to another RV. To solve this issue, we pulled into the best suited open site for us. I'm sure we took someone's assigned site. This location was quiet and a very few children running around. Utilities were acceptable, didn't try the pool, cable or WiFi. Our site didn't have large trees but most sites do. The sites are packed gravel and somewhat level. The streets are asphalt. The grounds were neat and tidy. The are was windy but not that bad. Just windy to not extend awnings. We did enjoy sitting out in the evening and watching the wonderful sunsets and sunrises. For a pull thru, the site was just long enough for a 30' TT. Had to park sideways and barely made it. Overall, it was quiet and will return again. We camped at Banning Stagecoach KOA in a Travel Trailer. Desert Outlets in Cabazon, Palm Springs and the tram, Hadley's Dried Fruits, Morongo Casino, Oak Glen (apples galore in season). Drive up the mountain to Idyllwild and find a very nice mountain village. Drive a little farther and find Lake Arrowhead and Big Bear. Both are mountain towns. TRAINS, TRAINS and more TRAINS!!! OMG up all night because they blow their horns all through town, there was a freight train every hour on the hour, don't stay here if you want sleep and have your window open. The dog park are is ok and large. I made reservations about 3 weeks in advance online, when we arrived the owner said the space she had put us in would not be long enough to stay hooked up with our tow......I had specified this when making the reservation. She moved us to an area by the storage and said we could "hang out" a bit.....so be aware that if you have a 32'+ RV w/tow it's a bit tight to fit in their pull thru's without unhooking. Glad we didn't get there after hours...don't know what we would have done. The grounds do have grass, some areas need to get "finished" with construction. The full timers are fairly clean, but glad we weren't staying a longer than a night. We camped at Banning Stagecoach KOA in a Motorhome. Stay somewhere else, over priced unless you like train noise. Site was pull thru but with car attached would be significantly in roadway. As we were going to use the car anyway it was a huge deal for us. However, there is no cable. According to the office they will get it in September. There was no wifi. They said they didn't understand why as many people were streaming. Perhaps that's why we couldn't even get emails. And lastly the tree need some serious trimming. While we appreciate the shade in the summer heat, we need to get into our site scratch free and be able to open the roof vents. Better management is clearly needed. We camped at Banning Stagecoach KOA in a Motorhome. This was an easy overnight stop, a few miles off I-10 with easy access. Our site was mostly level, and just long enough to not have to unhook our 30 ft travel trailer. They are gravel pull-thru site with some tall trees for shade. I did not use the laundry room or restroom, but they looked adequate. Quiet, nothing within walking distance. Trying to find the office open was hit or miss, but when I did find it open, the women working was very helpful. The WiFI did not work, there was a note on the office door saying they were sorry and working on it, very frustrating! The small pool looked nice, and there is a small grassy pet area. I would stay here again, if they fix the Wifi. We camped at Banning Stagecoach KOA in a Travel Trailer. Town just a few miles away, easy drive to restaurants. Returned here again, and another good experience. Clean, well-maintained, friendly and helpful staff. 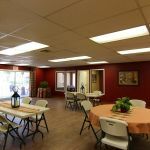 While not cheap, it is a reliable and comfortable stop along I-10. Close to I-10, easy on/off, but no traffic noise. Excellent fenced, grassy dog park. Will return again. We camped at Banning Stagecoach KOA in a Motorhome. Spent two nights. Nice location at the bottom of San Jacinto SP. Wonderful sunrises and sunsets. Mile or two south of I-10, could not hear the traffic. Quiet, except for the locals racing up Hwy 243. There is a Union Pacific mainline close but train noise was not very noticeable. Friendly staff and clean premises. The roads are paved and our site was gravel. The trees at our site could use some trimming. Small branches caused interference with both slide outs. This is our second time staying at this CG, so I guess we like it! We camped at Banning Stagecoach KOA in a Travel Trailer. Nice pullthru, good utilities. Were able to park with toad attached. Site was level. Some shade from trees. Good amenities, including enclosed grass dog area. Good overnight stop, easy on/off from I-10 but far enough away to not have traffic noise. While a little pricey, everything was in good order and worked well, worth it after a long day's trip. We will stay here again. 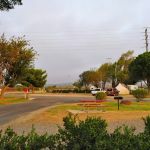 We camped at Banning Stagecoach KOA in a Motorhome. The Shell station at 2192 W Ramsey St. (just off I-10 at 22nd St) was set up well for gas fill-up with toad attached. 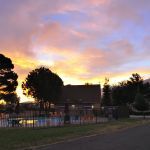 We enjoyed staying the night and using the pool due to the heat. Nothing to write home about but clean and friendly. Dogs loved it. We camped at Banning Stagecoach KOA in a Travel Trailer. We stayed 1 night as we were passing through. The front office staff was very nice. Park has lots of shade & grass except where they put us. It was all gravel. Pool could of been a little cleaner. Lots of spiders. Need pest control bad. 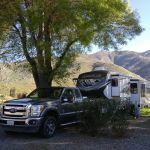 We camped at Banning Stagecoach KOA in a Motorhome. Assigned us to a site already occupied, finally got us into a site in the long term area next to a broken down trailer with a mean dog on a long chain. Could not reach sewer connection with two long hoses; the dump station was not in operation. Only 1 person on the desk so check-in service was very slow. Not really big rig friendly, most of the pull-through sites are going to require you to disconnect. We camped at Banning Stagecoach KOA in a Motorhome. Are you affiliated with Banning Stagecoach KOA ?